Put simply, a thermal store tank is a large, well insulated hot water tank and forms the heart of your home heating and hot water system. A thermal store (or accumulator or buffer tank) stores up heat from a boiler stove or solar panel that can then be used to heat the house and provide domestic hot water whenever it is needed, even if the stove isn't lit or the sun isn't out. The thermal store also lets you easily link up different heat sources. A classic combination is a woodburning boiler stove (winter heating and hot water), solar panels (summer hot water) and a conventional boiler (to provide a back up). Other sources can also include a ground or air source heat pump, an electrical heating element or a wood pellet stove. Because you are storing the heat it means that a stove only has to be lit once a day and it can be run efficiently, rather than being kept smouldering all day. The classic cycle is to light the boiler stove in the evening to heat the house and enjoy the fire. All the excess heat is stored in the thermal store. The stove goes out but the heat in the tank is used to warm the house in the morning and provide the domestic hot water. In the afternoon the central heating draws the rest of the heat from the store to warm the house before you return from work and light the stove again. Learning what the insulation is made of, and how thick it is, will take you a long way towards answering that question. The best thermal store insulation is sprayed on polyurethane and it should be around 100mm thick. Cheap tanks use foam rubber. To give you an idea of the difference, 100mm of sprayed on insulation is equivalent to 600mm of foam rubber. A tank with 100mm of polyurethane insulation which has been properly plumbed in and properly lagged shouldn't be losing more than 1-3 degrees in 24 hours. A foam rubber insulated tank will lose around six times as much heat as one insulated with polyurethane. Some tanks use a synthetic fibre in a flexible plastic jacket which has a very limited insulation value. (i) Storing heat from a wood or pellet boiler for central heating or supplying an independent hot water tank – no coils needed. (iii) Storing heat from a solar panel – this will need a solar coil. What are called Solar Plus tanks have valves so that the solar gives its heat first to the top part of the tank and then, only when that is hot, does it bring heat into the lower section of the tank. This gives DHW faster and makes the solar panel work more efficiently. What are the coils made of? The better tanks have copper coils, which transmit the heat more quickly and effectively, cheaper tanks have stainless steel coils. Are the coils finned? Finned coils have a much greater surface area and so transmit the heat much better. How long are the coils? The longer the coil the quicker and more effectively it conducts the heat, thus giving more DHW per minute or making the solar panel work more efficiently. Does the tank have a baffle? Good solar tanks have a baffle in the tank about a third of the way down from the top. This seals the top third apart from a hole in the middle of the baffle plate and so maintains much better stratification. Are the tappings recessed or flush mounted – flush mounted tappings make it easier for the installer to do the tank connections and, most importantly, make it easier to achieve continuous insulation from tank to pipe. How many tapping points are there and what for. Can the tank go on a pressurised system or only an open vented one? If you are comparing one tank with another then compare the answers to these questions to see if you are really getting value for money. EnergyStore thermal stores are specifically designed for use with biomass boilers such as wood boiler stoves and wood pellet boilers. An EnergyStore makes it easy to combine renewable inputs like a biomass boilers and solar thermal hot water systems with conventional inputs like an oil or gas boiler. 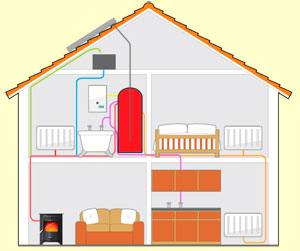 As a result you end up with a properly integrated whole house heating and hot water system. The various tappings on the EnergyStore have been positioned so as to give flexibility and choice and to help you get the most from your energy sources. Akvaterm tanks are designed to be at the centre of your modern low carbon heating system which would typically incorporate a wood boiler stove and solar thermal panels for the summer. There are a number of different types of Akvaterm thermal store suited to different applications and situations, and they come in a range of sizes from 300l up to 10,000l.